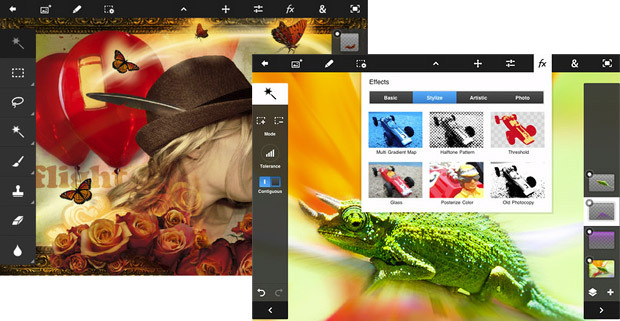 What some do not know is that Adobe has the world famous image editing program Photoshop for iOS and Android on the market. Now Photoshop Touch gets an update for both operating systems, which brings some new features with it. Firstly, because we had the long awaited 7-inch optimized for tablets. Only limitation is of course a tablet with a 7-inch display, but a resolution of 1024 x 600 pixels. Thus, including the Google Nexus 7 or the Amazon Kindle Fire would be compatible with the update. Otherwise, there are several other new features for the mobile Photoshop. Since we have, for example, new effects, improved strokes and sharing options for Facebook and Co. But of course there are a few other improvements and new features, but looks just have a look. Available for $10 from the Apple App Store and the Google Play Store, the software works on tablets only.